I've been spending the last few days working intensively on my plans for the New Zealand bike tour. Time is passing very quickly and, as is usual, the closer a date nears, the faster it seems that time propels you towards it. My aim has been to ensure that the majority of the planning phase was completed before I head back to England in early December. I have never planned for an adventure of this nature and magnitude before and although I have made a great deal of research and progress with my own plans, there is one nagging question that is a constant companion to me: what have I missed? Planning for an adventure is not easy. That is how I wish to think of this latest chapter in my life story, an adventure. It is the adventure that I have longed for all of my life. When I think on it, it reminds me of my first foray into travelling and backpacking. Eight years ago (is it really so long ago already? ), when I headed off to Thailand with my partner, I had no idea what I was doing. Due to various physical and psychological reasons, I had not prepared for the trip as I should have done and as a consequence, and I stumbled blindly in the dark, feeling afraid, overwhelmed and lost for the first two or three weeks, until I began to find my feet and come to terms with it all. It was a truly horrible and daunting experience, and not one that I ever wish to repeat. Preparation is key and cannot be underestimated. Despite having to deal with the aftermath of the 'bomb' that was dropped on me (please see my previous post entitled Broken Promises and a Change of Plans) and all that went with it, I have made some great progress in my planning endeavours. The ripples of that shock spread far and wide and affected almost all of my entire planning. The only part of the planning left unscathed was my route plan for the South Island. I have been extremely fortunate though and despite this setback, I have managed to rectify everything. I've see it as rather fortuitous in some ways. I am now able to begin my cycle tour nineteen days earlier, which means I'll be cycling for a greater part of the New Zealand summer, which more importantly means that I'll now avoid the need for cycling in the midst of a Kiwi autumn. The bottom line: more sun, more warmth, and in theory at least, less rain. The on-coming autumn was the major factor in my decision to begin my original tour route in the South Island, starting at Picton, and to finishing in the north in Auckland. I designed it in this way to ensure that I would complete the most southerly part of the ride before the cold Antarctic winds began sweeping up from the south, bringing their icy blasts. As I am picking up my rental bike in Auckland, this meant jumping on a train with the bike and panniers, heading straight down to Wellington, and making the ferry crossing of the Cook Strait, over to Picton. This is now avoided and I'll begin my tour, by pedalling away from Auckland. This South Island first plan was far from ideal as it meant heading back up from Wellington to Auckland, with huge zigzags cutting across the country, so that I could take in all of the places that I wish to see. With the revised route, I'll cycle down the west side of North Island to Wellington, and then after my South Island section is complete, I'll head back up mostly on the east side to finish in Auckland. Not everything has been as I would have wished though. With the new start date forced on me, I contacted Cycle Auckland to see if I could rent the Cannondale 2 earlier. The medium frame Cannondale was not available until 3 February at the earliest. Despite the dropped bomb, I actually saw this as my first major stumbling block - funny how the mind works. In its place, they were able to offer a Scott Sportster, but I knew from my research, that this was not a true touring bike. Then those great people at Cycle Auckland came up with another suggestion. They would hold both a Scott Sportster (medium) and a Cannondale 2 (large) for me and I could take which ever of the two suited me best. They also suggested that I make a short tour of the Northland area first, so that I could switch over to the medium Cannondale on my way back through Auckland before I headed south. Initially, I was not too keen on this plan but I could see nothing else for it. I had always envisioned myself beginning my tour by pedalling away from civilisation and out on to the open roads, where I would find myself and discover just exactly what cycle touring is all about. Now, I would have to leave Auckland only to return again, effectively breaking up my tour. But, after some thought, I made this work for me. 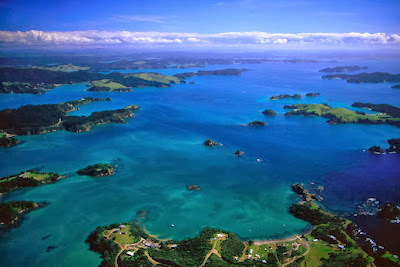 The North Land region of New Zealand is home to the Bay of Islands, a place I have only previously seen in photographs and not visited. And the Bay of Islands is the jump of point for scuba diving the Poor Knight Islands, one of the greatest dive sites of the world's oceans (Jacques Cousteau had it in his top ten). Why then not build in a few days stop at Paihia, dive the Poor Knights and tick off one of the places from my personal bucket list of dive locations? Perfect. There is always a silver lining, the trick to finding it is to stop focusing on what is past and has gone wrong, and, with a mind clear of negativity, to look at what is and what will be. I've also spent these last days researching tents. Who knew how time consuming and complicated that was going to be! It is my plan to spend as much time sleeping in a tent as is possible. For a trip of three months, it is not financially viable for me to spend each night in a hostel, motel, or hotel bed. The tent will more than pay for itself. The nature of cycle touring New Zealand means that I will find myself in some very rural areas where locating accommodation would not be possible. Even with all of the best planning, something will inevitably go wrong, and I could find myself stuck in the middle of nowhere as night begins to fall. I must have a contingency plan for this possibility. Perhaps though, the main reason why I am taking a tent, is to make this a real adventure. It has to be this way. It was always going to be this way. Wherever I am able, I plan on some wild camping, that is unofficial tent pitching on public or private land that has not been designated an official camping site. I know that partly this will be out of necessity, but also, there is this voice inside of me that has always yearned for adventure and for the chance to roam free. I have decided to write a separate post about the range of tents on offer and how I narrowed down the choices and made my selection. It is quite bewildering how many types, manufacturers and differing opinions are out there. I am also giving some thought to whether I begin a separate blog site for my cycle tour (Cycling The One True Path) or I continue to write here. This blog is about life on the path and I do not wish to dilute it with posts about more mundane matters such as bicycles and tents. But the path is the path, right? The jury is still out on this one. What I have learned over the last weeks is that setbacks will always occur, they are inevitable. When we hold a vision for our future, a dream in our minds, and something goes wrong, this is an opportunity. Here is a chance to test your mettle and your resolve. A dream formed in the heart with strands from the fibres of your soul, that's a dream that can never die. From each setback, we learn. When we learn, we grow. As we grow, so too do we evolve. As we evolve, then we walk the path, our one true path, the path that takes us to the light of ourselves. And that is the light of love. I really enjoy your blog and hope to read more of your adventures! Keep it up and happy new year. Thanks Ian. That's very kind of you. It's not been easy to write these last couple of weeks, but I'll be back at it shortly - don't you worry! Knowing that I have readers out there that enjoy my writing inspires me to continue, it tells me that I have something of worth to say. Merry Christmas and Happy New Year to you.